Update: Redskins senior vice president of communications Tony Wyllie said the team sends out letters similar to this one whenever they can as a gesture of support for American men and women in uniform. An area NFL team has proved that being a fan can go both ways. Capt. 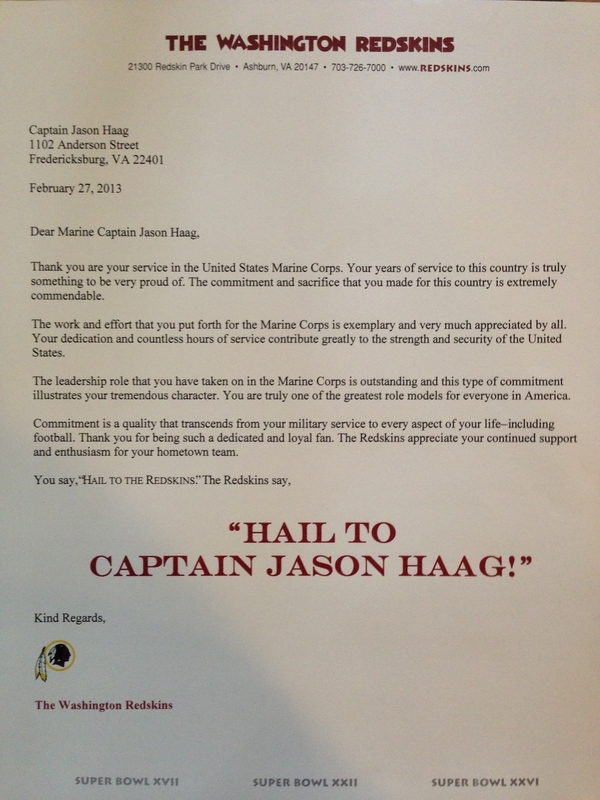 Jason A. Haag of Fredericksburg, Va., who marked his last day on active duty yesterday, opened his mailbox today to find a hearty salute from the Washington Redskins. On official team letterhead, the note thanks him for his service and wishes him well. A lifelong ‘Skins fan, Haag said he was overwhelmed by the letter. “It was amazing, I’ll be honest. It pretty much made me cry,” he said. Haag said he isn’t sure who tipped the Redskins off, but he suspects Dave Ellis, a photographer for the Free-Lance Star of Fredericksburg who shoots Redskins games. Ellis has been following Haag and his family around for a month for a story on Haag’s ongoing battle with post-traumatic stress, also documented on Haag’s blog, Usmcrazy.com. Haag served two deployments in Iraq and one in Afghanistan in his more than 13 years of service and received a Purple Heart for combat wounds sustained in 2003. He was medically retired from Quantico. He expects the series of stories about his journey to come out next month.